> Art—GMs>"Always Room For One More"
Imagine being back in the mid-1970s. The public’s demand for V8 power drops as fuel shortages cause the price of gas to skyrocket. Long line ups at service stations are routine and people reconsider their current 8 mile per gallon rides. Dealerships and used car lots are flooded with big block beasts, like Chevelles, Camaros and Novas, as customers desperately trade them in at a loss for more fuel efficient transportation. In the frenzy, you have the foresight to realize just how special "bowties" are. With prices too good to pass up, you begin to assemble a few of your favorites. We enter the imaginary setting, winding our way through an impressive collection of some of Chevy’s most highly prized street brawlers to see our savvy Bowtie enthusiast unload his latest acquisition, a Baldwin Motion Camaro. His eyes scan the property for a place to park it and his mind calculates the moves needed to make it fit. A smile comes across his face, as he says to himself, “The collection is comin’ along fine, but there’s always room for one more...”! Also available: "Found Room For Two More" and "Make Room For Three More"
Limited Edition Print 22" x 28" - Limited to 800. 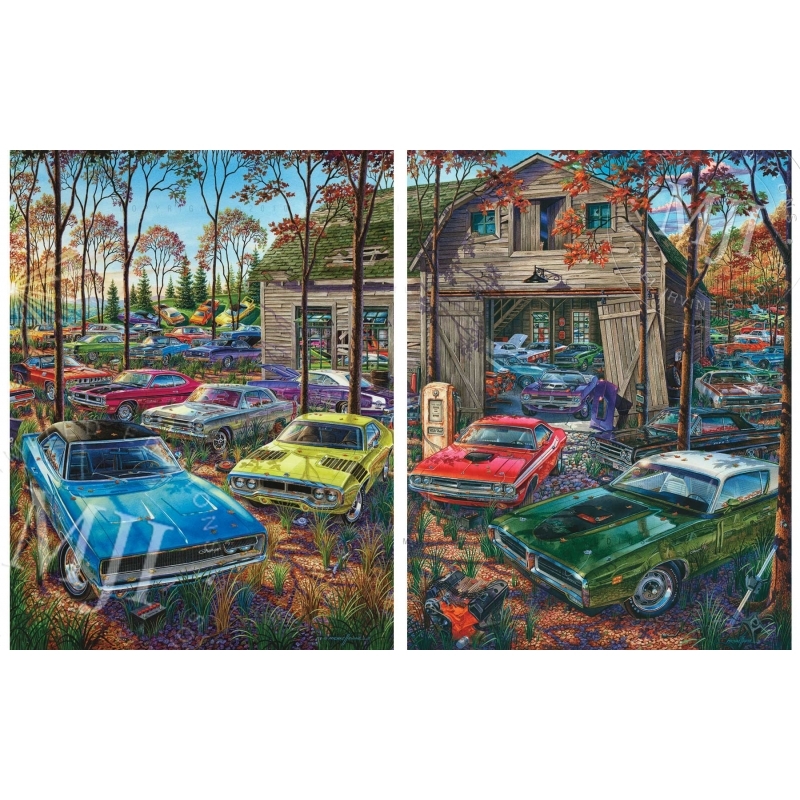 (Image size 18" x 24") 10pt satin finish, acid free, museum quality archival paper. Choice of available print number. Indicate top 2-3 choices below (eg #200/800). Last 3 digits of VIN numbers are popular. Artist Proof with Single Custom Done-to-Order Remarque 22" x 28" - Only 20 total APs released. (Image size 18" x 24") 10pt satin finish, acid free, museum quality archival paper. Remarque is "custom, done-to-order" in pencil or painted in watercolor (your choice). Call/email Linda to discuss your Remarque. Artist Proof with Double Custom Done-to-Order Remarques 22" x 28" - Only 20 total APs released. (Image size 18" x 24") 10pt satin finish, acid free, museum quality archival paper. Remarques are "custom, done-to-order" in pencil or painted in watercolor (your choice). Call/email Linda to discuss your Remarques. Gallery Edition Canvas (All the detail—twice the size!) 36" x 48" - Limited to 50. SOLD OUT. Personalized, Hand-Retouched Gallery Edition Artist Proof on Canvas 36" x 48" - Limited to 5. SOLD OUT. 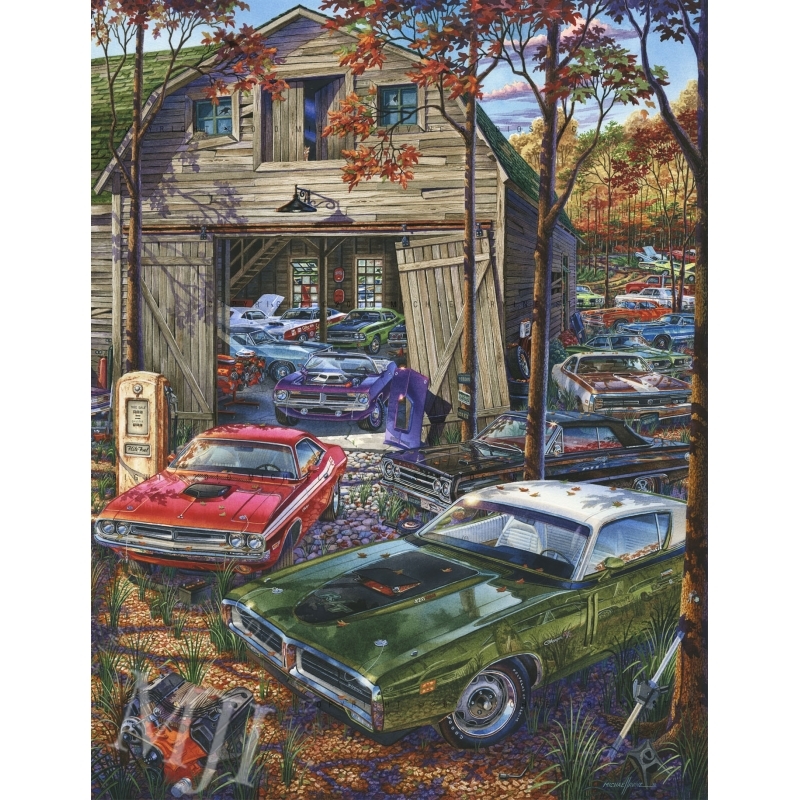 "Mopar Farm Numbers Matching Set"